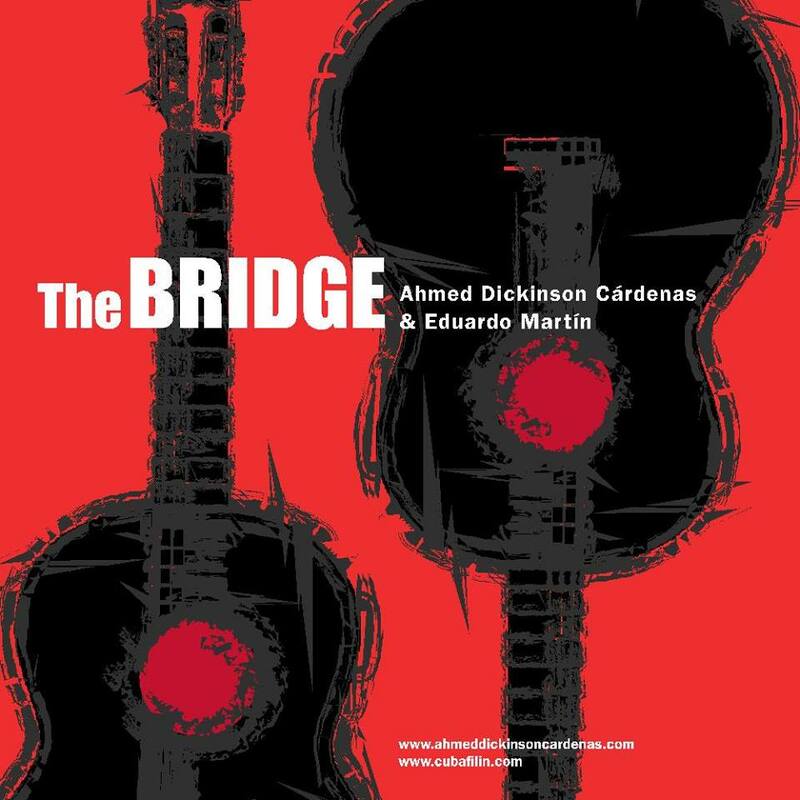 Multi award winner guitarists Eduardo Martín & Ahmed Dickinson Cárdenas from Cuba embarked on their first Maltese appearance introducing their spectacular album “The Bridge”. 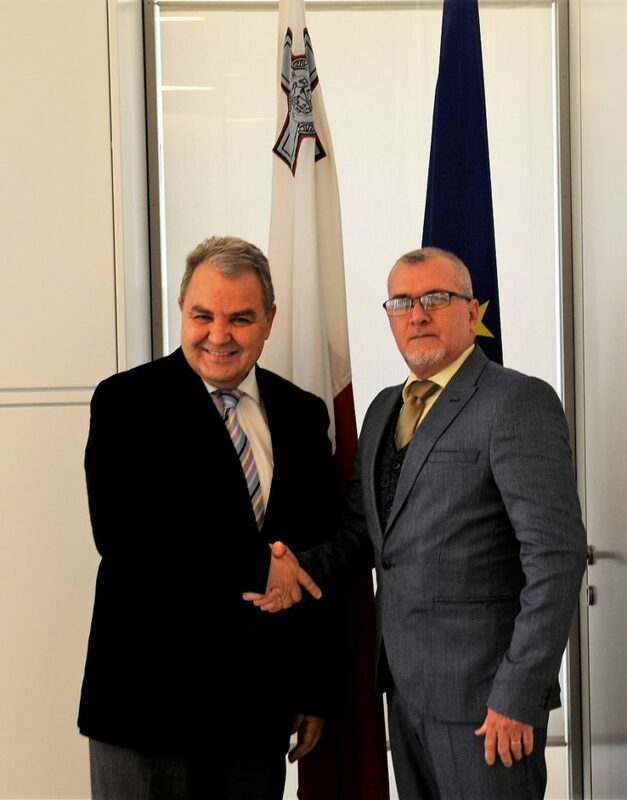 Ambassador of the Republic of Cuba José Carlos Rodriguez Ruiz paid a courtesy visit to Speaker of the House of Representatives Anglu Farrugia. Speaker Farrugia and Ambassador Ruiz highlighted the positive relations between the two countries and recalled his official visit to Cuba in September 2017, adding that he still cherishes the memories of the warm welcome he received. The two dignitaries discussed the political, economic, and social situation in Cuba, with the Cuban Ambassador elaborating on the recent legislative and economic developments in Cuba. They also spoke about issues of mutual interest, inter alia, health, cultural, and environmental cooperation. José Carlos Rodriguez Ruiz was accompanied by Jorge Luis Alfonzo Ramos, Minister Counsellor, and Rebeca Cutie Cancino, Counsellor at the Cuban Embassy in Rome. 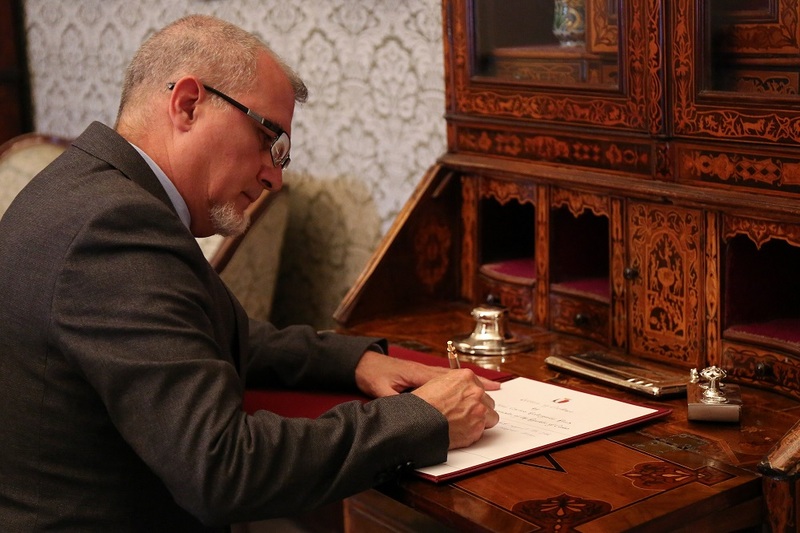 Ambassador of Cuba José Carlos Rodriguez Ruiz presented his credentials to President of Malta Marie-Louise Coleiro Preca at The Palace, in Valletta. 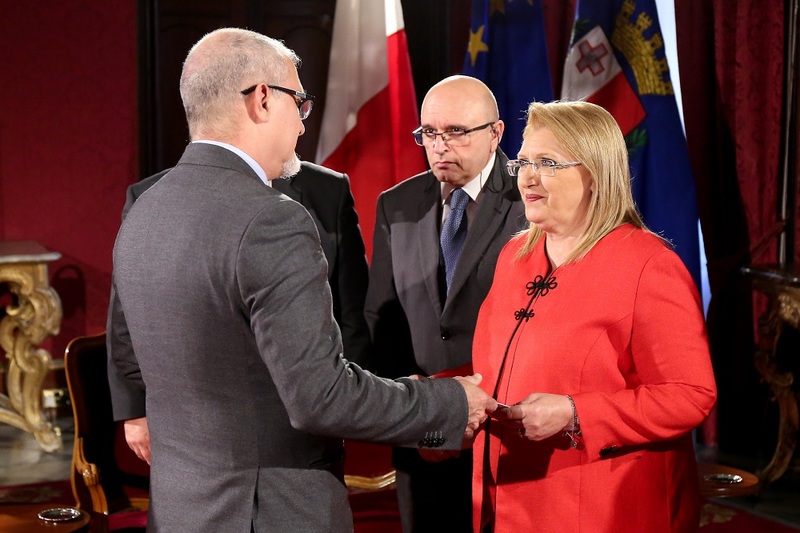 During the ceremony, the President of Malta and the Ambassador discussed bilateral relations. Ambassador Rodriguez Ruiz holds a degree in International Political Relations from the Higher Institute of International Relations of Havana, as well as a Master’s Degree in International Relations, from the Diplomatic School of Madrid. 1987-1988: He took part in a military mission, as an officer, in southern Angola. He received a decoration as an internationalist fighter. 1989-1991: Officer in the Division of Europe of the Ministry of Foreign Affairs in charge of the affairs of the German Democratic Republic (GDR) and the Federal Republic of Germany (FRG). 1991-1993: Third Secretary at the Embassy of Cuba in Germany, Bonn. 1993-1997: Officer in the Division of Europe of the Ministry of Foreign Affairs. 1998-2000: Officer in the Division of Europe of the Ministry of Foreign Affairs, in charge of matters with Italy, Vatican, Republic of San Marino, Republic of Malta, the Order of Malta and the European Union. He made visits and work meetings to the Ministry of Foreign Affairs of Italy and to the Vatican Secretariat of State. 2000-2003: Cultural Counsellor of the Embassy of Cuba in Italy. 2003-2006: Head of the Cuba Image Office of the Divulgation and Information Division (DDI) of the Ministry of Foreign Affairs of Cuba. Head of the Diplomatic Office of Cuba in Bonn, Germany. 2011-2017: Coordinator of the Office of Hypermedia, in the Division of Divulgation and Information of the Ministry of Foreign Affairs. Director of the Divulgation and Information Division in August 2013. In December 2013, promoted to Director of the Communication and Image Department of the Ministry of Foreign Affairs. The Malta Cuba Society has collaborated with the MCAST ICT Foundation College, where students helped in the development of a fresh mobile-friendly Malta Cuba Society Website and International biodegrade Posters. The Society thanked, MCAST ICT Foundation College student Nuwck Camilleri who designed and developed a content managed website for the Malta Cuba Society. As part of the Computer Graphics unit studies at level 3 Diploma in ICT all students created a poster using Adobe Photoshop and Adobe Illustrator to promote events for the Malta Cuba Society. 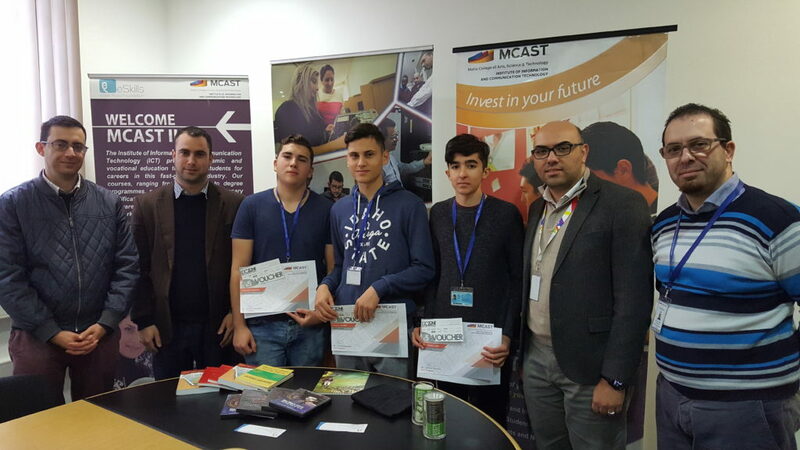 Two students Svetoslav Kasabov and Jacob Martin Dalli came first and second respectively. The Society also forwarded merchandise to the MCAST students Nuwck Camilleri, Svetoslav Kasabov and Jacob Martin Dalli as a small appreciation token. This year is surely to be considered as a memorable one for the members of the Malta Cuba Society. 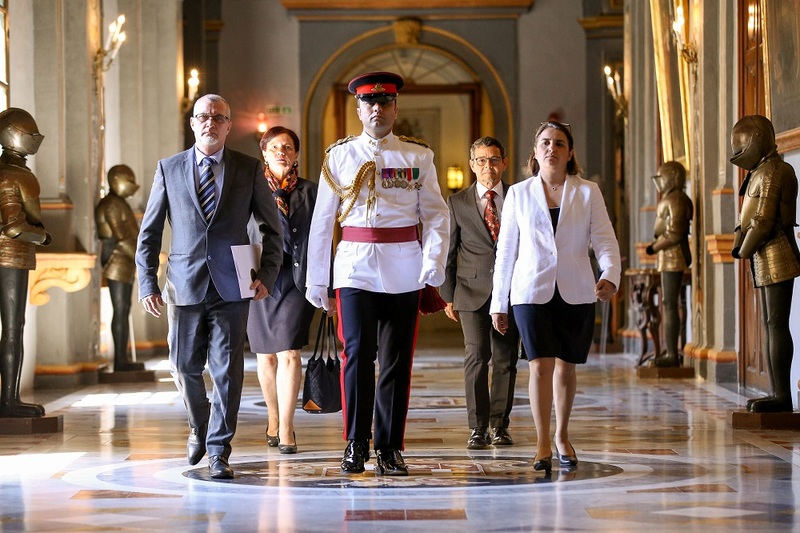 Back in January 2012, the new Cuban Ambassador to Malta Her Excellency Mme Milagros Carina Soto Agüero, visited our country on a three-day stay, to present her credentials to His Excellency Dr. George Abela, President of Malta. 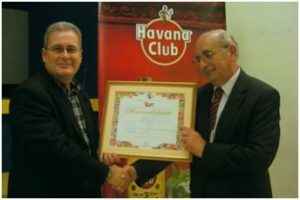 Elio Gamez Neyra (left), Vice President of ICAP giving a Certificate of Recognition to Mario Mifsud (right), Secretary of the Malta Cuba Society, on the occasion of the 30th Anniversary of the founding of the Malta Cuba Society. Members of the Malta Cuba Society had the opportunity to meet the Ambassador, residing in Rome, during a number of meetings. The Society also organized a reception on Thursday the 26th of January, in honour of Her Excellency. Here she had the occasion to meet with a number of politicians, government officers, representatives of the cooperative sector, the voluntary sector and other non-government organisations. With them she has discussed a series of possible collaborations between the two countries. 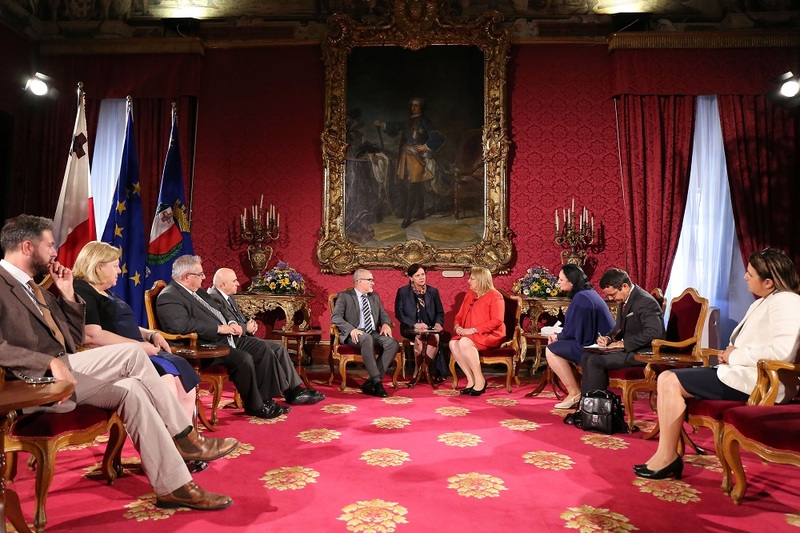 During this event, the Ambassador also addressed all the guests present, to express her gratitude to the members of the Society and all those Maltese who promote the friendship between the two peoples. On the occasion of the 30th Anniversary of the foundation of the Malta Cuba Society, a delegation from ICAP, the Cuban Institute of Friendship with the Peoples, visited Malta between the 15th and the 18th of April 2012. The delegation consisted of Elio Gamez Neyra, Vice President of ICAP and Roberto Rodriguez Dicks, Director of the European Department of ICAP. They were accompanied by the Political Counselor of the Cuban Embassy for Malta, Dr. Fidel Vladimir Perez Casal. The delegation also had the opportunity to meet with representatives of the Maltese Civil Society, including those from the cooperative, the business, the cultural and the trade union sectors, as well as those from the main political parties. The delegation also held a number of talks with Government officers and Ministers during their stay. 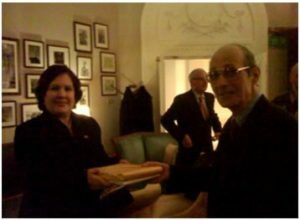 Michael Camilleri, President of the Malta Cuba Society , offering a gift to Her Excellency Mme Milagros Carina Soto Agüero, during the reception held in her honour. The 30th anniversary of the Malta Cuba Society was celebrated with a reception held at the Workers’ Memorial Building in Valletta on the 17th of April, in which the Malta Cuba Society was given a Certificate of Recognition to mark this important occasion. During a short speech in which Mr. Elio Gamez Neyra addressed the guests present for the reception, he thanked the Society for its hard work to promote the friendship between Malta and Cuba on both a cultural as well as on an economic level, and said that the Cuban people appreciate the solidarity which comes from a small and distant island such as Malta. The Malta Cuba Society joins the International Solidarity with Cuba Campaign, in demanding the unconditional release of the four Cubans (Gerardo Hernández, Ramón Labañino, Antonio Guerrero,and Fernando González) imprisoned in the United States since 1998 for participating in an antiterrorist operation to prevent acts planned from southern Florida against their country. After the release of René González, who became the first of the ‘Cuban Five’ to be released from jail after serving his full term and the conditions of his parole, the Malta Cuba Society continues to support the cause for the freedom of the other Cuban heroes so that justice is served and all five men are free and returned to their families and homes. The Malta Cuba Society is also promoting the ‘Voices for the Five’ website (www.voicesforthefive.com), a hub of an international coalition of campaigners, solidarity groups, legal professionals, human rights organisations, politicians, trade unions and international personalities, fighting for freedom and justice for the Cuban Five. The handshake between US President Barack Obama and Cuban leader Raul Castro, at a memorial service for Nelson Mandela in South Africa, has recently brought new hopes for the restoration of full diplomatic relations between the two neighboring countries. Since 1961, two years after the Cuban Revolution, these relations had deteriorated substantially and have been marked by tension and confrontation including a trade embargo by the US against Cuba. The Malta Cuba Society which has worked locally for more than 30 years for the promotion of the cooperation and friendship between the peoples of Malta and Cuba, is now working for the development of economic relations with Cuba and has launched the Malta Cuba Cooperative. This initiative has been taken to start working on a number of projects involving Maltese investment in the Caribbean island, as well as the cooperation between the two countries in the health sector. The Cuban Five are five Cuban men who are in U.S. prisons, serving four life sentences and 75 years collectively, after being arrested in September 1998 and wrongly convicted in U.S. federal court in Miami in 2001. They are Gerardo Hernández, Ramón Labañino, Antonio Guerrero, Fernando González and René González. They were falsely accused by the U.S. government of committing espionage conspiracy against the United States, and related charges. But the Five pointed out vigorously in their defense that they were fighting terrorism — they were monitoring the actions of CIA-backed Miami-based terrorist groups, in order to prevent attacks on Cuba. The Five’s actions were never directed at the U.S.government. They never harmed anyone nor ever possessed nor used any weapons while in the United States. Following decades of attacks on its territory (arson, sabotage, murder, and the use of biological weapons) emanating from anti-Cuban terrorist groups in Southern Florida, and after repeated refusals by the United Nations and the US government to take corrective action to prevent such attacks, a group of unarmed volunteers from Cuba came to the United States to monitor the activities of the mercenary groups responsible for those attacks as well as the organizations which supported them and to warn Cuba of their aggressive intentions. In September, 1998 five of these men, later to become known as The Cuban Five, were arrested in Southern Florida by agents of the FBI and held in punishing isolation cells for 17 months before their cases were brought to trial. At first they were charged with the nebulous charge of conspiracy; that is, under US law, an agreement to commit espionage (the government of the United States never charged or claimed that actual espionage had occurred since no classified military documents were involved). In addition, they faced lesser charges of using false names and failing to notify federal officials that they were performing work on behalf of Cuba while in the U.S. Seven months later a new charge was added: conspiracy again, but this time for murder against one of The Five, Gerardo Hernandez, as a result of an intense public campaign to avenge the shooting down of two aircraft of an anti-Castro group and the deaths of its four occupants two years earlier by the Cuban Air Force as their planes were either in or just about to leave Cuban airspace. 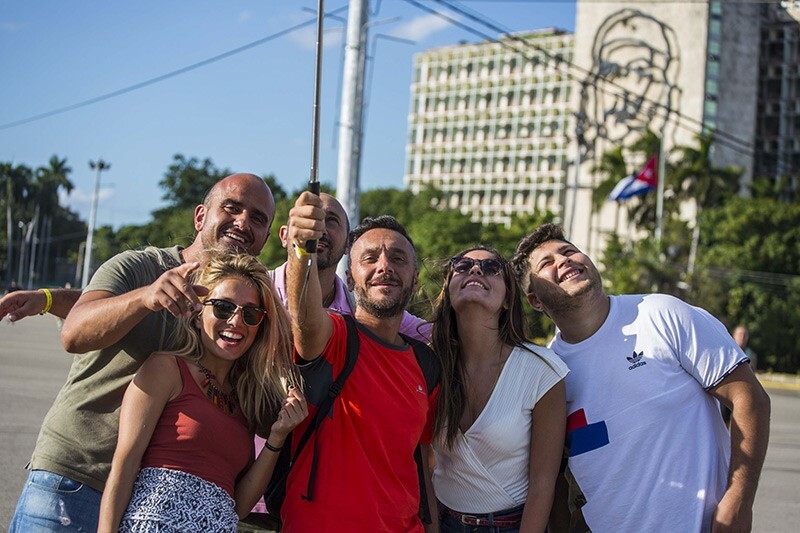 The planes were part of an organization which in the previous twenty months had penetrated Cuban airspace twenty five times, each incident having been protested by the Cuban Government. The shoot down occurred only after the Cubans had officially warned the U.S. that henceforth its airspace would be defended. Over strenuous objection by the defense, the case was ordered to trial in Miami, Florida, home to over half a million Cuban exiles, a community with a long history of hostility toward the Cuban government – a record which a federal appellate court in the United States later described as a “perfect storm” of prejudice, precluding a fair trial. Each of the 12 jurors chosen to judge the case, and who expressed an opinion about the Cuban Government, were hostile. The three prospective jurors who claimed neutrality about Cuba were removed by the government. The trial consumed over six months of court time, becoming the longest trial in the United States at that time. Over 119 volumes of testimony and more than 20,000 pages of exhibits were compiled, including the testimony of three retired generals of the army, a retired admiral, the former advisor to President Clinton on Cuban affairs (all called by the defense) as well as high ranking Cuban officials. At the conclusion of the trial, and just as the case was about to be submitted to the jury for it’s consideration, the government filed an extraordinary appeal to a higher court seeking it’s intervention since it had failed to prove the major conspiracy charges, claiming it faced an “insurmountable obstacle” to winning the case. After that appeal was rejected, the jury, nonetheless, convicted The Five on all charges, having been put under intense pressure from an intrusive media whose cameras chased the jurors to their cars so their license numbers could be broadcast as well as anti-Castro protesters who demonstrated in front of the courthouse. Following their conviction The Five were sentenced to unprecedented long terms of imprisonment in five widely separated maximum security prisons. Gerardo Hernandez was sentenced to two life terms, Antonio Guerrero and Ramon Labanino a life sentences each, Fernando Gonzalez nineteen years and Rene Gonzalez fifteen years. The three with life sentences became the first in the history of the United States to receive life terms in cases without secret documents. The initial appeal took over twenty seven months to complete with a three judge appellate court panel throwing out all the convictions due to the denial of a fair trial in Miami. In an unusual move, the government petitioned the entire Court of twelve judges of the Eleventh Circuit Court of Appeals to review the panel decision in a procedure called en banc. One year to the day later the Court, with a strong dissent by two judges, reversed the 93 page decision of the three original judges, rejecting the finding that an environment of violence and intimidation pervaded Miami. In the last quarter century that Court, sitting en banc, had never ruled in favor of a person charged with a federal crime. In the meantime, On May 27, 2005 the United Nations Working Group on Arbitrary Detention, after studying the arguments presented by both the families of the 5 and the United States government, determined that their detention was arbitrary and urged the United States government to take measures required to rectify that arbitrariness. The Working Group stated that, based on the facts and circumstances under which the trial was held, the nature of the charges and the severity of the sentences, the deprivation of liberty of the 5 violated article 14 of the international convention on civil and political liberties, of which the United States is a signatory. A portion of the appeal is still pending with nine issues remaining to be decided by a panel of three judges. The last event in the appeal was an Oral argument that took place before the three judge panel of the 11th Circuit Court of Appeals on August 20, 2007. This hearing was one more step in the long appeal process of these five men since they were sentenced in 2001. As in the past, the Government of the United States was once again unable to refute the arguments of the Defense and sustain the accusations against the five. For its part, the Defense, demonstrated irrefutably that the improper conduct of the Government during the entire legal process against the five constituted a flagrant violation of due process that influenced the entire proceeding, primarily by the way in which the Prosecutor invented facts that were not proven at trial, promoted a hostile environment and manipulated the evidence and the jury. Other key arguments of the Defense that demonstrate the arbitrariness of the process is lack of evidence to sustain the two main accusations—conspiracy to commit espionage and conspiracy to commit murder in the first degree—and the imposition of completely irrational and unjustifiable life sentences. The Government itself admitted during trial that it could not present a single secret document to prove espionage and that it faced an “insurmountable obstacle” to prove the charge of murder. Throughout the tainted process the Government admitted that its real concern was to protect the anti-Cuban terrorist groups that operate with total impunity in Miami and to punish those who fight against them. Last September 12, these five men, accused of crimes they did not commit, began their tenth year in prison only because they attempted to protect Cuba from terrorist acts. Cuba like the United States and any other country of the World has a legitimate right to defend itself against the scourge of terrorism that has harmed so many victims. This is a critical juncture in the case with freedom for The Five hanging in the balance. Between arrest and trial the five were held without bail for 33 months and also kept, for 17 months, in solitary confinement cells. They were completely cut off from their families and young children, and not even able to communicate with each other. On August 2001, prior to the sentencing hearings of the trial, they were sent again to “the hole” for 48 days. Just as their cases were being readied for appeal in March of 2003 all Five were summarily cast into isolation punishment cells once more “on orders from Washington” according to the local prison administrators who were perplexed by this directive since all had been behaving in an exemplary fashion. On that time, the U.S. Department of Justice decided to keep them in solitary confinement alleging “national security” reasons. The U.S. authorities imposed to them the so called “Special Administrative Measures” (S.A.M. ), allowed under 1996 federal regulations when there is a suspicion that communications of inmates in federal prisons could endanger the national security or could lead to acts of violence or terrorism. They were again sent to “the hole”, preventing their contact with the world. Their communications with the lawyers were cancelled. The visits were prohibited, including the consular ones; they were not allowed to receive correspondence, or to use the phone, or even to communicate with their families and lawyers. This measure was adopted by the Government of the United States in a crucial stage of the legal process, when the lawyer-client contacts are vital and the lawyers were focused their attention in the preparation of the appeal statements. The Five have been in custody for over 9 years. During that time Gerardo Hernandez’ wife, Adrianna Pérez, has not been granted a visa so she could visit her husband. Nor has Rene Gonzalez’ wife, Olga Salanueva, as well been permitted to visit Rene. For other family members, the United States Government has continued to delay unnecessarily the granting of entry permits. This means that the average number of visas granted per family member (including mothers, fathers, spouses and children) is barely one per year per family member. Accordingly, in most cases family members have been able to visit only once a year on average, even when, in accordance with the visitation arrangements of the respective prisons, visits could have taken place more frequently had a visa been granted. Amnesty International has decried the denial of visas to the two wives Adriana Pérez y Olga Salanueva as violations of international law. In a recent letter (January 2007) to the U.S. State Department, A.I. stated: “this measure is unnecessarily punitive and contrary both to standards for the humane treatment of prisoners and to states’ obligation to protect family life”.